I normally try to avoid comment on how exhibitions are branded or what they're called. 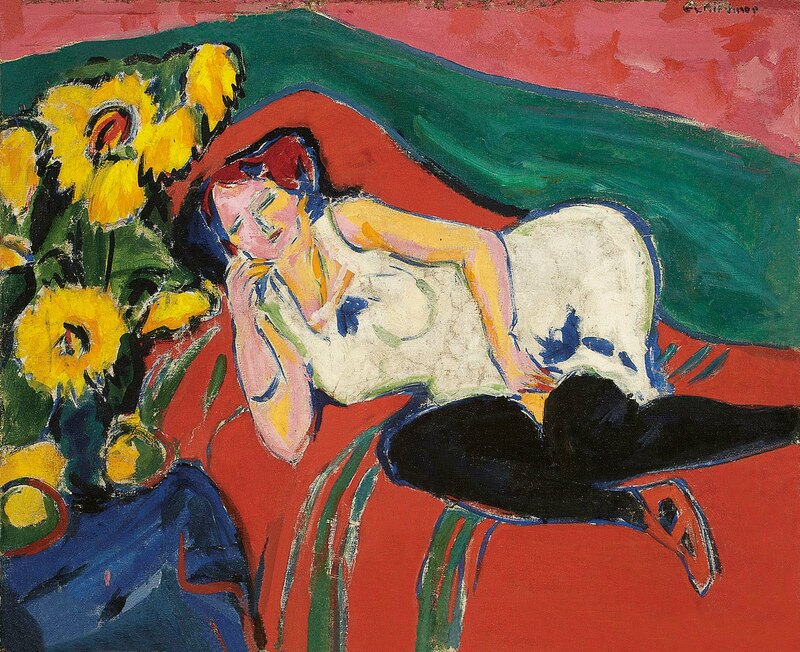 In the case of 'European Masters' the NGV's show of works from Frankfurt's Stådel Museum. The problem might be that the catch all title doesn't quite capture what's going on here. The lead image of a Renoir lunch suggests an impressionist blockbuster awaits inside. Instead the NGV houses a path through the neurotic spasms of a national identity seeking a form. That nation is Germany through the nineteenth and into the early twentieth century. There's some great and compelling works hung inside here but there's also a lot of painting that is, frankly, kitsch and odd. Edited and pulled together it creates an interesting narrative, made sinister as we know the tragic point where it ends. So whilst there are great examples of Degas and Bonnard here they're not the real story, instead the odd procession from Romanticism through Symbolism to Expressionism captures something much stranger, if less immediately pleasurable. German Romanticism is a complex set of impulses. 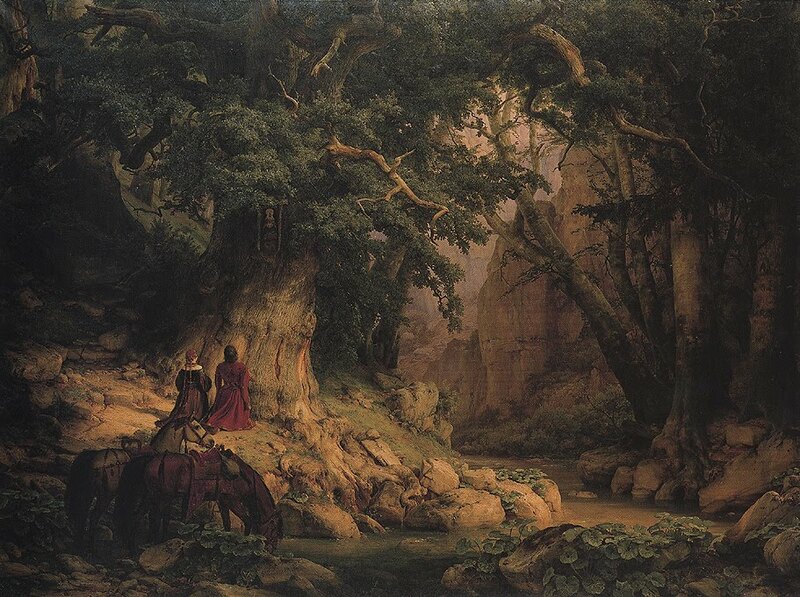 Here it encompasses the neo-classicism, pagan fantasies and historical mythmaking. The pictures here show less of the primal urge toward the sublime that we might find in Casper David Freidrich and a far more twee version. Medieval and classical figures find themselves in the dark German forests, forging a link between the geography and culture. The images are polite, bloodless and a highly mediated version of nature making this very different fare to Romantics such as Goya or Turner operating elsewhere. Lighting is often theatrical and compositions tend to signpost the meaningful relation between the landscape and those inserted into it leaving each work looking like a restrained polemic. What becomes clear here, and never leaves through the rest of the rooms, is a penchant for fairly heavy handed symbolism without a corresponding stylistic tension. The approach feels all or nothing. Certain works look like academic exercises whilst others are full of bombast, all too often what they fail to provide is depth or ambiguity. It seems fitting that in amongst the German work, and a respectable room of impressionism, there are smatterings of artists like James Ensor and Henri Rousseau, who are almost sui generis and and yet seem to add to the feverish searching of German artists. 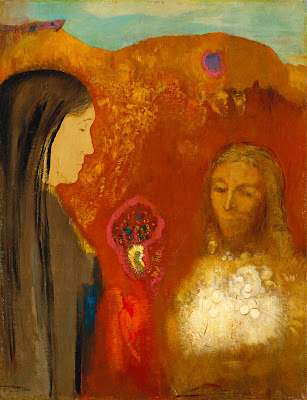 Amongst these figures is Odilon Redon. The work 'Christ and the Samaritan Woman' is of such hallucinatory beauty and mystical strangeness that one can hardly bear to walk away from it. There is a biblical story in there somewhere but it hardly matters. A Christ figure, manifests out of a layers of ochre at once a mirage and the memory of someone real. In the foreground the profile of a woman who is almost sculptural but who, with the greatest economy of paint, appears to be in a state of transcendent serenity. There's an abstract splash of purple in the middle of the frame and a scarlet wound of paint, like the sacred heart and something like a cloud or a splash below Christ, describing them is hard but together they feel like something necessary and essential that happens between these two figures. The tenderly minimal expressions (both have eyes downcast or closed) convey a sense of grace and surrender and allow us to identify the human core of something deeply spiritual. It's a wonderful quiet painting. There are surprises. 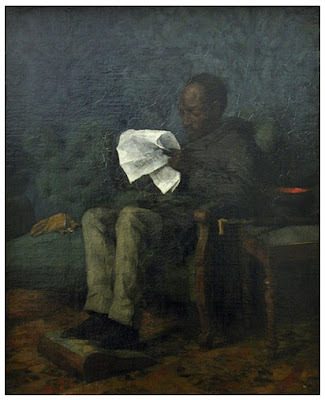 Wilhelm Trübner's 'Moor Reading a Newspaper' is beautiful and a real shock. This small portrait takes on the drab black blues and greens of workman's serge and imparts an oily quality to the air. The composition cuts the frame in a diagonal as the seated figures rest his feet, the light of a nineteenth century room hardly picking out black skin. It's the light that makes this so brilliant though. The only objects that stick out form a line across the middle of the painting, a pair of gloves on the empty portion of the chaise, the snow white newspaper and a hat and cane. This isn't a work that attempts o make exotic, rather one that defiantly normalises with symbols of bourgeois life. The newspaper, holding its form in a black hand is genuinely shocking, it's the last way you'd expect a black man in 1870's Germany (a mere ten years after American emancipation) to be presented. There's a point in the exhibition where we see things start to lose their serene myth building. Where the subject and implicitly the viewer violently shifts. This is best seen in the way women become vampires and harpies having been the maidens and nymphs of a mythical bucolic past. Hindsight makes it tempting, and all too easy, to draw sociological and political conclusions but even if we avoid them it's clear that colour and form begin to change. There is a line of sinister, grotesque women that begins to appear with the symbolists. 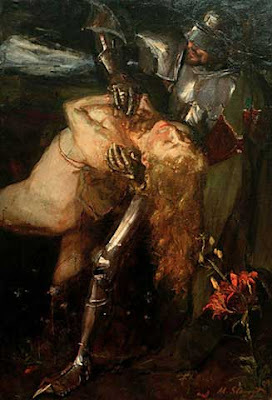 We see Lovis Corinth's slutty daubs and palate knived flesh and the bone pale temptress of Max Liebermann's 'Samson and Delilah' and, in both, women's skin itself seems toxic and dangerous, evidence of something hateful inside. This is where Max Slevogt's 'Frau Aventiture' is so revealing both thematically and the way paint restlessly clings to the canvass. The areas of pink and grey, flesh and steel, hard and soft just reinforces the idea of a conflict between male and female. What appears to be happening is unsure, a knight either lifting or strangling a naked woman, you can't help feeling it's the latter as it all takes place on a queasy green darkness. Without delving into the sexual politics it is both bravura and unpleasant. It's probably not the done thing to express a pretty much blanket dislike for the many strands of German Expressionism. I've often thought that if anything were going to make an art movement impervious to criticism it was its censure by Adolf Hitler. This might be the root of my problem with the German strand of Expressionism. I understand the context and significance of Max Beckmann but more often than not his paintings descend into a caricature of neuroses on canvas. The twisted geometry and ugly decapitated proportions feel like a potent political cri de couer but are all angular aggression. 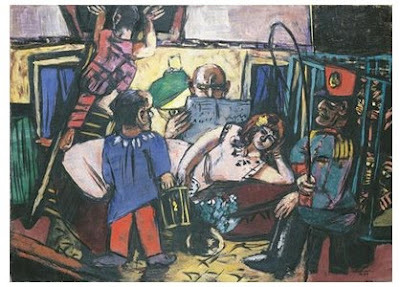 It's hard to love these pictures even when, as in 'The Circus Carriage' Beckmann is creating and exposing his own personal mythology. Context can define the value of a political act, and Beckmann's defiance of Naziism through paint is inspirational, it can't determine aesthetic response. My lack of sympathy for much expressionism comes from its inability to give a human access point to the work. The dark and light all comes in a flash in expressionism, and then another flash and a series of fireworks on top of one another until we're blinded. It's a sensational conceit but it suffers from a law of diminishing returns as the volume is constantly turned up to eleven. The work from the painters of 'Die Brücke' and the Expressionists here is often violently ugly. It often uses the clash of colour, and also of expectation of shape and colour, to to create a sensory disruption that has a psychological analogue. The effectiveness is undeniable but the sheer boldness make the works one dimensional. Whether these are the response to a violent world or the expression of an assaulted psyche or otherwise doesn't really matter, they seem to take a single emotional dimension at the expense of subtlety or ambiguity. 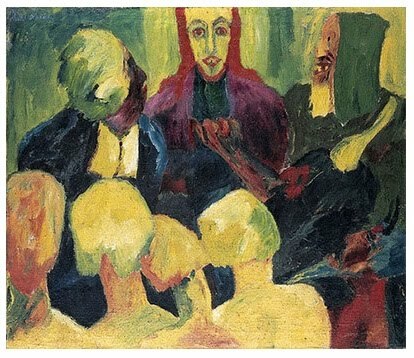 That heavy handedness can be seen here in work by Emil Nolde and Franz Marc and it's as alienating as any Brechtian technique. 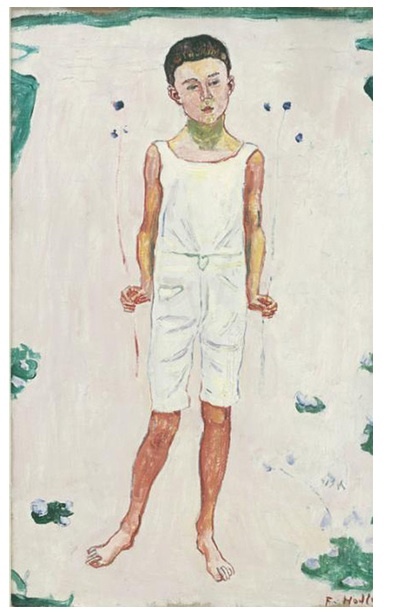 This is in sharp contrast to works by artists such as Egon Schiele who captured no less angst and shock but retain their effectiveness because they're shown in concert with the brittle frailty of people. There are two different stories at play in 'European Masters'. In one there is the battle for the visual identity of a nation, the discovery and rejection of a mythology. The second only just begins in the final room. It shows how the early Twentieth Century was less a crossroads for art and more a spawning ground. Multiple avant gardes and modernisms spring from it, the battle becoming one for self-expression rather than a single path or movement. All through this show there are works of power and beauty: August Macke's 'Naked girl with Headscarf', Kirchner's 'Reclining Woman in White Chemise' or Ferdinand Hodler's 'Childhood' all have the power to move. As an exhibition this challenges and enlightens which is in itself a fine thing, that much of the work might not be to my taste doesn't really matter and I'm simply glad the NGV have tried to tell an important story.